When you think of advances in new technology, “concrete” is not really a subject that that you would immediately think of. But in fact decorative concrete has come a long way since Frank Lloyd Wright used it as a key design element in the many homes he designed over 100 years ago. 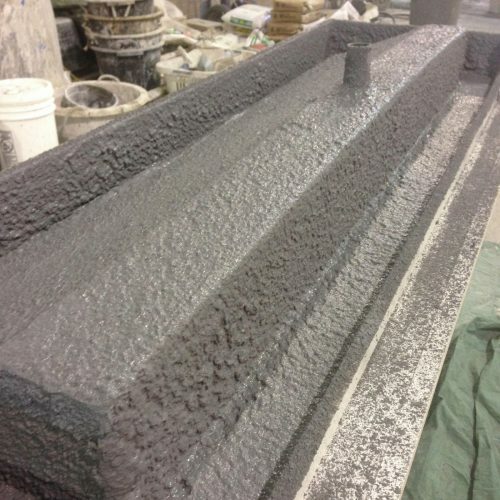 Engineered Cementitious Composites (ECC), and High Performance Fiber-Reinforced Cementitious Composites (HPFRCC), provide superior tensile and compressive strength over traditional concrete mixtures, and have the unique ability to flex and self-strengthen before fracturing. Typically used for structural applications in the construction industry, the same techniques are now being applied to wall panels, countertops, sinks, furniture and other design elements. Weight and Time New mix designs using polymers, glass fibers and specialized aggregates and admixtures eliminate the need for traditional steel reinforcement, and allow much thinner, lighter and stronger products than traditional wet-cast techniques. In many applications, the material can be de-molded in a matter of hours and reach a high-early strength in a very short period of time. Concrete Sealers, typically have been the achilles heel for decorative concrete applications have made huge strides in the last few years. Superior stain and scratch resistance, water repellency and color enhancement, coupled with a variety of polished finish levels have eliminated many of the traditional knocks against decorative concrete projects. What should it look like? Most competent fabricators these days can make concrete look like anything they want, ranging from a clean solid color finish to wood, terrazzo, granite, marble, glass inlays etc. While these look-alikes are still popular, many architects and designers have come full circle and are opting for the more traditional industrial, minimalist, grey concrete look, coming full circle back to where it all started.